Astro – turf sport pitches are fantastic tools for multi sport surfaces in the UK but like anything, they require maintenance to ensure that they work as designed and specified and to ensure that they remain safe for the end user. There are a few different types of synthetic astro turf all weather pitches that are used in the UK, these include 3G / 4G surfaces, sand filled and sand dressed pitches. Sand filled pitches have most of the carpet pile covered by silica sand before being used, sand dressed is a surface which has the carpet pile covered by approx 70% of silica sand and both of these surfaces require very similar or the same maintenance. Our team can carry out sand filled pitch rejuvenation work to help keep your sports facility in top condition all year round. Feel free to get in touch with us through the contact form to get more information on the costs of the services we provide. Astroturf pitches can suffer from ingrained dirt and grime that can become troublesome for the surface. However, Algae squidge, sporn and moss are bigger problems for the STP / ATP. When the surface has lots of these materials on the surface, the pitch can become very slippy, very hard and suffer from a loss of drainage and become susceptible to surface flooding and pooling. This is when the MUGA and multi use games area requires rejuvenation, renovation and upgrading. The restoration of these surfaces can be done in a number of ways, one of which is sport pitch rejuvenation maintenance. The extraction and removal of the contaminated sand is the most effective and common and this will ensure that the contaminated sporn and moss will be cleared from the surface, allowing the designed carpet to work properly again. The carpet pile is then refilled and new sand installed, thus giving the surface a revitalised lease of life. This can be done by either jet washing or air compression of the surface but we recommend the air compressor method as this is lots safer as it will remove more of the dirt. Jet washing can be successful but there is a risk that the contaminated sand will be pushed deeper to the bottom of the carpet meaning more poor drainage and slippery surfaces. There are also other ways to renovate and rejuvenate your ball court surfacing. Patch repairs, seam repairs and new fencing can all be achieved if required. There are a number of sports that can be played on these surfaces and they do not have to be contained to minimum designed sizes on the MUGA. 40m x 20m to 102m x 62m can be constructed, depending on the area and location of the facility. 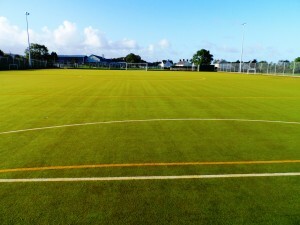 Football, hockey and multi sports can all be played on these surfaces. Please fill in our contact form if you’d like to discuss sand filled pitch rejuvenation maintenance for your facility and we’ll get back to you with some advice on costs for the work.